Aeromate’s team comprises of industry experts with interesting career paths, and are alumni from the Indian Institute of Management(IIM), Bangalore and Toulouse Business School, France- covering all areas in the Aerospace and Aviation ecosystem. Aeromate is the first and only one of its kind- an Aviation and Aerospace platform in India which is specifically designed to meet all Aviation and Aerospace man power requirements in the ecosystem. 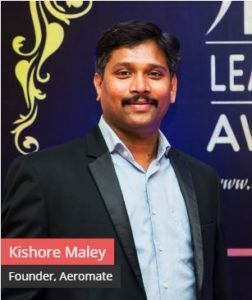 Aeromate is not just a job portal, it is continuously enriched with the hands-on experience of professionals ranging from services to technology covering all domains in the Aerospace and Aviation ecosystem and helping students and professionals by keeping them updated with the latest upgrades in the industry. As Aerospace and Aviation are poised to grow very rapidly and provide bright career opportunities, Aeromate helps the industry by bridging the gap in knowledge between the expectations from the industry and reality. Aeromate aims to be a key in shaping the success and future of budding students and professionals in the industry. Aerospace and Aviation are specialised domains with particular skill sets. Even a small error in the design of any job portal can lead to thousands of unemployed youth who may not have the resources to apply for the right jobs. This will lead to a gap in the industry in identifying the right employer and employee. Aeromate understands the practical problems when faced with a generic job portal. We have put in a lot of thought and designed this job portal to ensure that it captures the right talent for the right job. Our aim is to help candidates and employers to find the correct fit for their requirement, becoming the first and only platform in India where people can collaborate according to their specific needs in the Aerospace and Aviation ecosystem. Aeromate is the future of the Aerospace and Aviation ecosystem, handled by Industry professionals who believe in continuous improvement. An alumnus of both IIM Bangalore and Toulouse Business School in France, Kishore Kumar Maley is a seasoned aerospace professional with over 16 Years of diverse experience at both national and international level. Two decades of education and rich experience of handling responsibilities in different roles in Airline/MRO sector and Aerospace and Aviation IT Sector has helped him to understand the need of the hour in Aerospace and Aviation ecosystem.